Starts Aug. 20 and 22, 2019. Make this foundation-pieced Log Cabin Christmas Tree quilt in time for Christmas. All straight stitching; very easy to make. Great project for beginner or more advanced quilter. Click on the picture to learn more. See two versions of the quilt at Charlotte Sewing Center. Materials list can be found in the class description. Phone the Charlotte Sewing Center (704-525-9022) to register for the class. 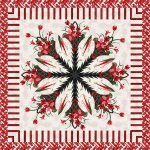 July through Nov. 2019 - Get help with paper piecing the Poinsettia Bouquet quilt by Quiltworx. Up for a challenge? Learn a new way to paper-piece, without so much tearing-out of the paper! Click the picture for more information. Purchase the Poinsettia Bouquet pattern and fabrics and bring them to this Sit-and-Sew for help putting it all together. If you have another Quiltworx-type paper-pieced quilt that you want some help with, you also are welcome to come to this 5-sessions class. To register call Charlotte Sewing Center, 704-525-9022. Starts June 11, 2019 Day and Evening classes. Learn all the quilting basics: fabric and batting selection and preparation, thread selection, rotary cutting, accurate piecing and matching intersecting seams, make the quilt 'sandwich', quilt and bind. Featured techniques are strip piecing, half-square triangles and curved seams. Attach mitered and corner stone borders, layer with batting and backing, quilt with a presser foot/walking foot and do some free motion quilting. There will be homework. In class we work on practice fabrics; at home you apply what you learn as you create your table runner. Six 3-hour class sessions. To register, call the Charlotte Sewing Center, 704-525-9022. Payment due at registration to hold your place in the class. Class Feb thru Aug. 2019. BLOCK of the MONTH PRESSER FOOT CLASS. Quilt is on display at the store. Explore special purpose presser feet and accessories as you learn to use and manipulate decorative built-in stitches on your machine. Discover uses for some of the beautiful decorative and specialty threads that are on the market; even ones that will not go through the eye of a needle! Maybe learn to make a few fancy embellishments! See the completed quilt at the Charlotte Sewing Center. Click on the picture for a full description of the class. Materials list can be found in the description. To register phone Charlotte Sewing Center, 704-525-9022. Payment due at registration.